Within the cancer therapeutics space, which today is worth over $100 billion globally, immunotherapeutic drugs have gained worldwide acceptance. This is because they are targeted therapeutics that have high specificity for cancer cells. Today, cancer immunotherapy drugs have captured nearly 50% of the overall oncology drugs market, generating about $54 billion in 2016 alone and are forecast to surpass $100 billion in 2022. This report describes the evolution of such a huge market in 20 chapters supported by over 180 tables and figures in 340 pages. An overview of cancer immunotherapy that includes: monoclonal antibodies, ADC’s, cancer vaccines and non-specific cancer immunotherapies and CAR T therapies. Focus on current trends in cancer immunotherapies that include: anti-PD-1 and anti-PDL1 drugs, Dendritic cell vaccines, T-cell therapies and cancer vaccines. Insight into the challenges faced by drug developers, particularly about the success vs. failure ratios in developing cancer immunotherapy drugs. Insight into the various immunotherapeutics available for specific cancer types. Description and data for the prevalence of cancer types that are addressed by cancer immunotherapeutics. Overall global cancer therapeutics market, leading market players and the best selling cancer drugs. Detailed account of the market for cancer immunotherapeutics by geography, indication, company and individual drugs. Summary table to identify the category of immunotherapy drug offered by the 79 companies. What is the global market for cancer immunotherapeutics by product class such as MAbs, vaccines and non-specific immunotherapies, through 2022? What is the global market for cancer immunotherapeutics by geography, through 2022? What is the global market for cancer immunotherapeutics by indication, through 2022? What is the global market for MAbs by type such as naked MAbs and ADCs, through 2022? What are the market values for Herceptin, Avastin, Erbitux, Yervoy, Mabthera, Adectris, and Keytruda? What is the global market for cancer vaccines? What is the global market for cytokines in cancer immunotherapy? The projected market values for Nivolumab, Tecentriq, DCVax-L, Imfinzi? What immunotherapies were approved between 1986 and 2017? What monoclonal antibodies (MAbs) were approved by the FDA to treat different types of cancers? What are naked MAbs and how many of them have been approved by the FDA? What are antibody-drug conjugates (ADCs) and how many of them are available in the market? What are the common cytotoxic “wareheads” used in ADCs? What are the important clinical assets in ADCs? How many bispecific MAbs are in late-stage development? What are the common side effects of MAbs in cancer immunotherapy? What are cancer vaccines and how many of them have been licensed to be marketed? How many cytokines have been approved for being used in cancer immunotherapy? What are the major checkpoint inhibitors in clinical development? What is the current status of anti-PD-1 drugs, dentritic cell therapies, T-cell therapies and cancer vaccines? What are the most valuable R&D projects in cancer immunotherapy and what would be their approximate sales revenues in 2022? Number of melanoma drugs approved between 1998 and 2017? Number of lung cancer drugs approved between 1998 and 2017? Number of brain cancer drugs approved between 1998 and 2017? What is the status of CAR T therapeutic approval? 10.25 Eli Lilly and Co.
16.2.1 What Co-Stimulation and Activity Domain is Optimal to Use? Table 3.16: Pivotal Phase III Rwesults for Yervoy in Second-Line Patients with Metastatic Melanoma..
Table 7.10: Estimated Number of New Leukemia Cases in the U.S.
Table 7.12: Estimated Deaths from HL and NHL in the U.S.
Table 7.13: Estimated Incidence and Deaths for Myeloma in the U.S. 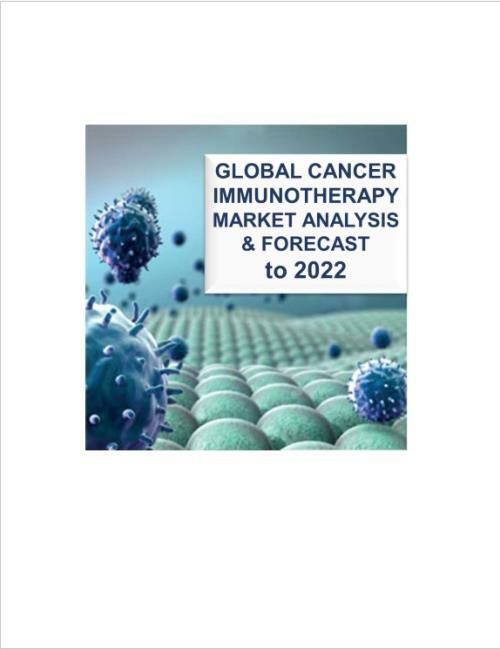 This analysis of the "Global & USA Cancer Immunotherapy Market Analysis to 2020” reveals that the cancer immunotherapy space will be a significant revenue generator (excess of $80 billion) for the biopharmaceutical industry by 2020. The market has been supported by the approval of Bristol-Myers’ Yervoy drug for melanoma, BMS's Opdivo and Merck's Keytruda, . Over the next decade, immunotherapies will be the backbone of cancer treatments in 60% of cancer types. It is forecast that by 2020, Avastin, Nivolumab, Revlimid, Rituxan and Xtandi will be the top five cancer drugs. A single drug, Bristol-Myers Squibb’s Yervoy, for example has earned revenues of about $960 million in 2013 and it is expected to have a market value of $1,775.2 million in 2020. Industry Experts have predicted that Keytruda and Opdivo will generate sales revenues of $2.9 billion and $4.3 billion respectively in 2019. “An unmet need in the cancer therapy market has paved the way for immunotherapies and has increased patient survival rates significantly” indicates Dr Deirdre Kelly. “Today significant therapeutic interest into ADC’s, checkpoint inhibitors, cancer vaccines and anti-PD-1/PD-L1 agents are taking the market by storm, and we forecast vertical growth in this area within the next decade’. Therefore it is no wonder that most science journals have hailed cancer immunotherapy as a significant breakthrough treatment. The interest on ADCs can be seen with the recent approvals of Adcetris (brentuximab vedotin) and Kadcyla (ado-trastuzumab emtansine). Currently, More than 15 companies are developing 30 different ADCs targeting both hematologic malignancies and solid tumors. ADCs represent a novel class of therapeutic agents, gaining increasing attention from both large and small pharmaceutical companies. As the ADCs carry a chemotherapy drug, they are believed to be more efficient and effective in the treatment of a disease. Due to shrinking pipelines and increasing pressure from patent expirations, big pharmaco’ recognized the vaccine market as a potential resource for investors. Cancer vaccines have been found to earn a higher profit than the generic drugs, owing to the nature of the disease and the urgency in the demand for these vaccines. The global market for cancer vaccines was worth about $4.4 billion and it is likely to reach $8.4 billion in 2020. Immunotherapy is a proven powerful tool, either as a monotherapy or as a combination therapy with chemotherapy or radiation. For patients with metastatic skin cancer or kidney cancer, immunotherapy has been found to be more effective than the conventional options, with the possibility of even a complete cure. Today, cancer immunotherapy drugs have captured nearly 50% of the overall oncology drugs market, generating about $41.0 billion in 2014 alone. This report describes the evolution of such a huge market in 20 chapters supported by over 180 tables and figures, over 317 pages.